Lovers of the Walt Disney Studios movie Ratatouille can now breath a sigh of relief as it has finally arrived on Blu-ray Disc. 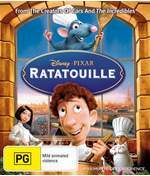 This latest edition to the Pixar Animation Studios franchise is a computer animated movie which revolves around a rat named Remy (Patton Oswalt) and an awkward "chef" named Linguini (Lou Ramano) who together help bring back the legendary restaurant of Auguste Gusteau (Brad Garrett) who recently passed away from a heart attack, suspected of being triggered by poor cuisine reviews. Somehow Remy the rat is not like his kin who has the ability to "smell" the variety of different ingredients in food. During one of his adventures, he and his family are broken apart and Remy finds himself lost in the city of love, Paris. In his time of solitude, Remy reads the cook book of Auguste Gusteau time and time again until he learns the secrets of his great chef. A chance encounter with Linguini, Remy helps this one-time garage boy become the greatest chef that Paris has ever known. Another classic Pixar Animation Studios movie that can be watched by anyone. The story contains humour, romance and that magic of Pixar as man and rat become best friends in a world that despises the rat species. The comedy and emotions that are portrayed by the characters in Ratatouille is magnificent which truly draws the viewer into this wondrous world. The video quality of Ratatouille is flawless and is presented in true 1080p HD widescreen which simply looks amazing on our LG high definition Plasma TV. The attention to detail in this movie is amazing and the lifelike characters who are portrayed in this movie. Apart from the crystal clear video, the audio is exceptional and Walt Disney Studios have flawless transferred the original computer graphics of this movie into high definition. The Cine-Explore special features are great and really gives the viewer an interactive experience behind the scenes which gives almost total control to the viewer. In conclusion, Ratatouille is definitely a fun move that can be watched by anyone and contains exceptionally amazing Blu-ray features. Definitely worth investigating! are stacking up in Gusteau’s kitchen. Help Linguini by moving quickly from station to station in the kitchen to prepare the right meal. If the guests are happy, there might be time for a delicious meal of ratatouille. briefing, documentary shorts, and deleted shots and scenes.